The 2018 ANACHEM / Society for Applied Spectroscopy (SAS) Detroit Symposium was held Thursday, Nov. 1 at Burton Manor in Livonia. The conference is devoted to analytical chemistry. ReBUILDetroit Scholar, Victoria Torres, along with several other University Detroit Mercy students (Kaitlin Lambert, Kayla Marshall, and Danielle Maxwell) presented their research poster, “Development and Validation of a Method Using QuEChERS and Liquid Chromatography-Mass Spectrometry for Atrazine Determination in Crayfish (Faxonius virilus)” that received the 2018 Undergraduate Student Award, which recognizes outstanding posters, oral presentations and papers presented during the symposium. The Association of Analytical Chemists (The ANACHEMS) was incorporated as a non-profit organization in 1942 to serve the professional needs of chemists in the Detroit Area. ANACHEM also works closely with the local section of the Society for Applied Spectroscopy (SAS) to organize a one-day symposium and exhibit every year. 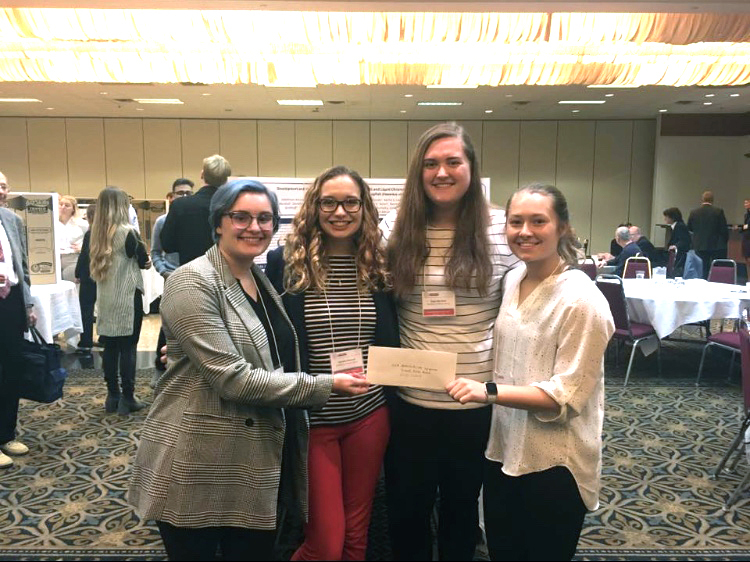 2018 ANACHEM / SAS Undergraduate Award Winners (from left to right Victoria Torres, Danielle Maxwell, Kayla Marshall, and Kaitlin Lambert).